And here's NCM260 again - being pedalled sideways by Alan Minshaw at Loton in 64. The trick is knowing where the photographers sit, so they can get a good shot of you through the screen. Rather enjoying the pictures being posted on this thread. I'm developing a nostalgia I can't actually claim! You had a ride in 660XYB not so long ago, doesn't that qualify you? Those Sabre 4 pictures are good. And can we assume the car was taxed for 12 months, expiring in 1964, so a 1963 modification? As you say, what racing history can be established? I don't know where to look, but I'd guess the archivist side of Dave would know. I have found some information on Argyle Motors racing history, in a 1964 issue of Reliant Review it mentions the following "From the north comes news of the Argyle Sabre team, led by Graham Austin. They took part in events at Oulton Park and Aintree and also in the hill climb at Loton Park. Formed earlier this year, the team is sponsored by Argyle Motors of Birkenhead, following a suggestion by Sabre enthusiast Mr J M Entwhistle. His son, Dr Ian Entwhistle will probably drive some of the entries in future events,"
If I find any more info I will post on this thread but maybe someone else has more information? This week 660XYB MOT'd OK with a couple of advisories - oil leak and slight exhaust leak. Oil leaks come with the territory, but the exhaust is tired and rusty, so I'm considering a replacement aft of the tubular manifolds. I can make up a system using Burton Power parts, using SS, even if it sounds a bit tinny. My questions are - any comments on Burtons Power stainless steel, good or bad? Is there any point in painting the SS to improve the life, and if so, what to use? I need to introduce about 1" deflection in an 18" length of pipe 1.75" dia, any suggestions on how to do this without kinking the pipe? Thanks for the suggestion, and they have a depot within 10 miles of me; I think I need to let them see the current arrangement before I get a quote. Yes I trailered the DET down to them so they could have a look and give me a quote. You can see from the thread how far we managed to get, the Liverpool-based (?) Argyle Motors photo is 1964, but I guess you need something from 1962 to have any chance of getting the regs changed. 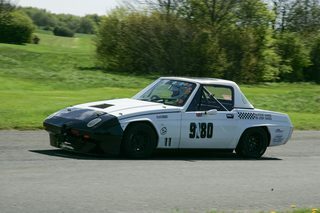 Good luck at Castle Combe, unfortunately we have family over with us at the week-end so won't be able to spectate.